Birds such as Pigeons and other territorial birds can be seen everywhere in the UAE and cause significant damage to property and health problems in humans. Birds can be carriers of diseases and are known to attack humans when they feel threatened. Bird droppings can clog pipes and dislodge items if not attended properly. Colored ribbons: Install strips of colored ribbons and position them on windows. The movement of these strips makes the birds move away. Wiring: Installing Wires in front of bathroom and balcony windows keep the birds perched on them whilst preventing them from landing on domestic surfaces. Bird spikes : Install nails on a wooden board at the edge of the window railing to avoid birds from perching and entering to create nests. 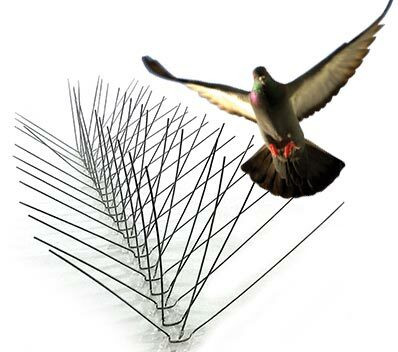 Wired threads: This wire threads prevent birds from standing on the surface of the buildings and they will fly. Use of the wire network: We use wired network in some locations, including the installation of electric wires to keep the birds away. Other products: Materials that work on the solar radiation in the required places, which are suitable for the birds of the solar system, resulting in migration from the place. We have special installation for different areas depending on the type of birds and their frequency. We at Smart Care take special measure to keep the birds away without harming them. Contact Smart Care Cleaning services now for best solutions at affordable prices.